First make the shape of the head like so. 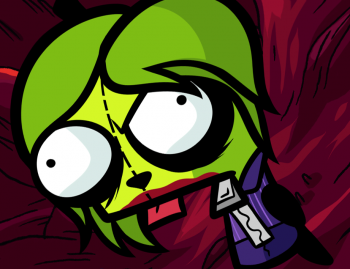 This is actually just the guide that you will use to draw the actual structure of Gir's Joker style head. Next, make two medium sized circles for the eyes like so, and be sure to make one of those eyes, have a pointed lid for the facial expression. Draw in the lining for the bottom part of Gir's face like so, then draw out the torso as well as the zipper tab and shirt collar. Make some dark rings around the bottom parts of his eyes like so, then draw and color in the nose as well as the pupils. Next up, we will draw in the Joker style hair, as well as the tab that is coming from the mouth. 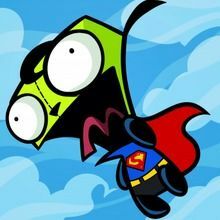 Add Gir's ears, and legs, then draw in the colored top lip, as well as the suits design or line work. Erase the mistakes you may have made, then you're done. 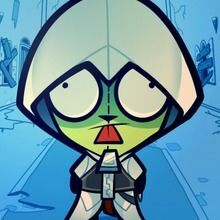 Here is Gir when you are complete. Now all you have to do is color him in using the shades that you would if you where to color in a drawing or coloring page of the Joker from Batman.